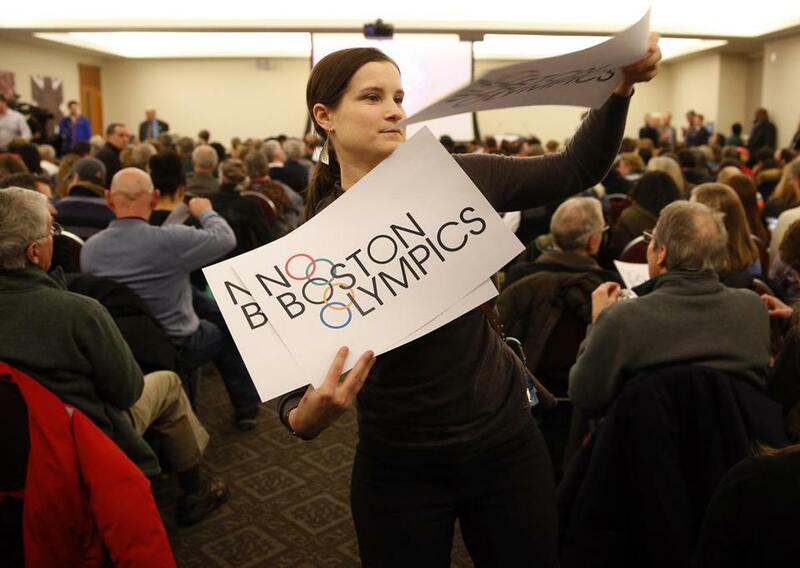 Claire Blechman, of Somerville, handed out No Boston Olympics signs before the start of an Olympic and Paralympic Bid Community Meeting. The citizens group No Boston Olympics is a big advocate for transparency, except when it applies to itself: After calling for the local Olympic bid committee to be more transparent about its donors, the opposition group Tuesday declined to make public its own donor list and the amount it has raised. The very active group opposing Boston’s bid to host the 2024 Summer Games is a 501c4 organization, which is not required to release donor information, said Chris Dempsey, a co-chairman of No Boston Olympics, in an interview. Dempsey said the group’s leadership discussed a Globe request made last Friday for contributor data and concluded “there may be an assumption by the donors that these contributions were anonymous.” The group believes people who do not want the Olympics in Boston should be able to support the opposition confidentially without fear of reprisal, he said. No Boston Olympics accepts credit card donations on its Web page, with suggested donation amounts up to $2,024. Dempsey said it is more important for the local Olympic bid committee, Boston 2024, to be transparent because the bid committee is asking for at least $1 billion in federal tax money for Olympic security and is expected to seek a publicly backed guarantee against shortfalls in the Olympic operating budget. “The onus is on Boston 2024 here,” he said. The opponents regularly accuse Boston 2024, a private nonprofit organization, of being too secretive. Last week, in testimony before the Boston City Council, Dempsey said No Boston Olympics wanted to see more transparency in how Boston 2024 is raising money to support its multimillion-dollar bid campaign. Boston 2024 lists donors by name on its website, without the value of each cash or in-kind contribution. One donor is listed as “anonymous,” representing an individual donor, according to the committee. The committee said Tuesday it would update the list with more names in the coming days. The bid committee announced in November that it had raised $11 million from private sources. Since Boston was named the US bid city in January, the committee has raised an additional $11 million, with “lots of prospects” pending, according to someone with knowledge of Boston 2024’s fund-raising who is not authorized to speak on it. The bid committee intends to raise $75 million to develop and promote the city’s Olympic proposal over roughly the next two years. The committee revealed Monday that it was paying its staff about $1.4 million a year, including an arrangement with Deval Patrick that would pay the former governor $7,500 a day for occasional travel on behalf of Boston 2024. Dempsey said the average donation to the opposition group is $100.97, and the group is run by volunteers drawing no salaries or wages. “It is David vs. 100 Goliaths when it comes to financial resources,” he said. The US Olympic Committee in January chose Boston to represent the United States in a worldwide competition for the 2024 Olympics. The International Olympic Committee is expected to choose the 2024 host in mid-2017.